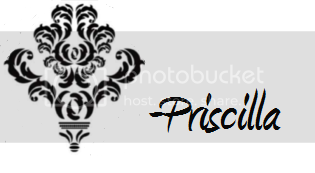 Thrifty Crafty Girl: 25 Days of Christmas - I Have A Black-Belt In Christmas Tree. 25 Days of Christmas - I Have A Black-Belt In Christmas Tree. I am a Christmas tree decorating master. Really. People come from far and wide to see me decorate the tree. Of course, that could be because of the one year that I got stuck under it while decorating and my family just kept laughing and taking pictures of me. I could have died under there. Branch layer by layer, I tuck the lights in. Tuck, tuck, tuck. 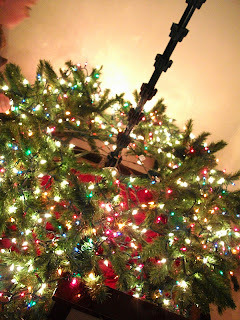 Around this time, my husband offers unhelpful extremely helpful advice about not falling in the tree. Also around this time, I give him a dirty look followed by an exasperated sigh. 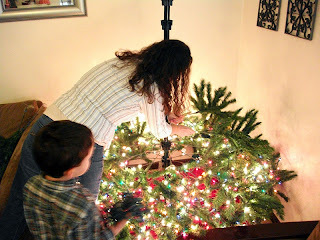 I enlist the help of my oldest son, who is more than willing to get underneath the tree to pass extension cords up to me. I use twist ties to secure them to the pole in the middle and if I get under the tree again I might get stuck and my family will take pictures and I might die under there. Jonathan also hands me the lights when I need another strand. I won't tell you how many strands of lights are on the tree but I'm sure we're going to blow a fuse. You know that scene in "Christmas Vacation" where Clark turns on the lights and the whole grid goes out until they kick on the backup power? It's a bit like that. After the lights comes the ornaments. The whole family gets in on this part and we tell the same stories about the same ornaments every year. It warms my heart. 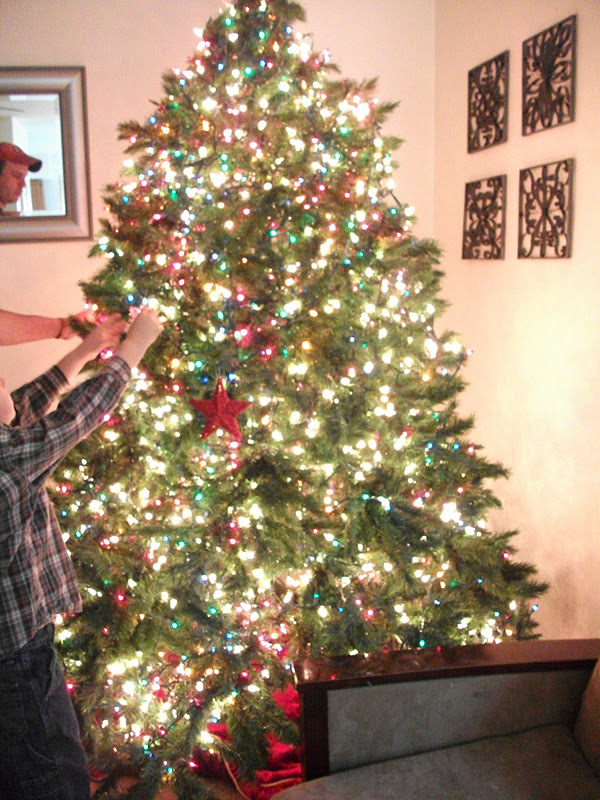 The hubs and my oldest son are hard at work putting the ornaments up while I'm resting after the lights extravaganza. I might have been barking orders at them. There's really no way to know now. Putting the tree up is a family affair for us, just like I'm sure it is for your family. I have friends who say that they don't have time to put a tree up or don't feel like they're in the Christmas spirit... I feel sad for them because this is one of the best parts of the season for me. It's Gorgeous! I have a serious fear of LIVE Christmas Trees...they make me sick!!! Your lights look great. I can never convince my hubby that those cords aren't supposed to be seen. One year he had extension cords down the middle of it! No lie. But, at least he puts them on there for me. I love Christmas trees! Bee-you-tee-full!!! We purchased our home and then a huge artificial tree for Christmas. We went from the bottom up from pole to tip, just like this for our first Christmas...only for our first Christmas. My husband refused to use that many lights again. It certainly was bright and I can see you tree is. I love to decorate the tree with my husband and daughter too. Have a great week! 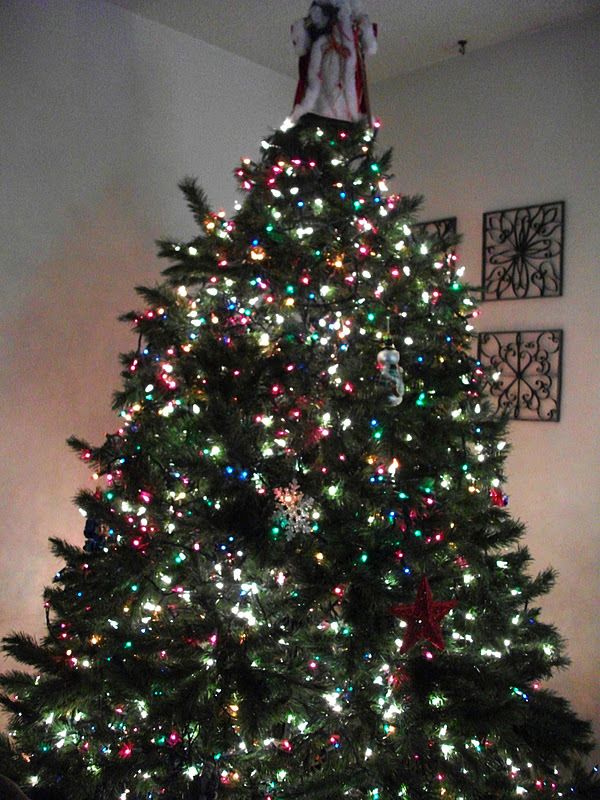 After viewing your very impressive tree, it is confirmed that I need to add more lights to mine. That is what a Christmas tree should look like, well done, as always! 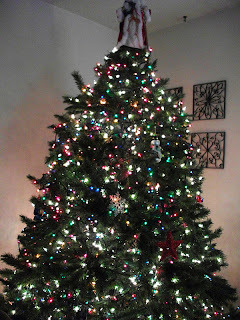 Thank you so so much for sharing your lovely tree at my Christmas tree linky!!! Wow, that's a lot of lights and they are soo lovely! what a nice tree decorating! Thanks for the inspiration.